It's been almost three months since COMPULSION hit the shelves. Those of you who know me know that being "published" is something I've dreamed of all my life. I didn't really set out with a plan until 2010, but what can I say, I'm a late bloomer. And I still remember how HARD it was to figure out where to start. How all the information swirling at me about how to write, and what to write, and how to get an agent, and how to get published just made me more confused. That's why this blog exists; it's a place where I and a few friends started trying to figure out how to become less mystified by the whole publishing thing. Now that I'm on this side of the publication process, am I any less confused? Not really, but I've learned a few things that surprised me. 1. Not much changes . . . I may have fought for publication for years, but my day-to-day life is the same sleep-deprived, yoga-pants-wearing, living-on-coffee-and-Nutella existence that it was before my novel was published. I still get to scrub toilets, struggle with income taxes, and study brilliant books by my favorite authors that make me achingly aware of how far I still have to go with this whole writing thing. 2. Everything changes . . .The book exists in bookstores. My friends and family stop by the book section at Target when they’re shopping for groceries, and they email me photos of my book beside books by real authors authors I love authors my friends and family have actually heard of. Some people buy the book. Some even read it. And they tell me, “I’m reading your book,” or “I love your book,” or they send me these amazing reviews, and my brain grinds to a stop Every. Single. Time, because I don't have the grace or the words for the surprise and gratitude and overwhelmingness that goes along with what I feel. 3. Readers bring their own lives into every story . . . Of course, I knew that, because I’m a reader, too, and I know how much books have always meant to me. But I didn’t anticipate how it would feel to get a message from someone who bares themselves and thanks me for mirroring something they have felt, or for taking them out of a hard place in their lives. Meeting readers as an author, online or in person, is a constant, joyful surprise. Every note or comment from a reader is like unwrapping a gift. Except when it's not. 4. Reviews are fascinating . . . Even the worst reviews show just how much the filter of a reader’s life brings into their own, individual reading experience. And no matter how much the reviewer loved the story, or enjoyed it, or hated it—no matter how much they hoped it would be more like something else, or how late they stayed up reading it past their intended bedtime, the simple truth is that they still read my book. The book that I made up inside my head. Which is awe-inspiring and gratifying and deeply humbling. 5. It’s not a hobby anymore . . . The friends and family who used to secretly exchange she’s-a-bit-delusional-but-we-love-her-anyway smiles (the sort of smile familiar to every writer or artist), those same doubters suddenly see my writing as a “serious endeavor.” They expect me to know unknowable things, like how my book is doing or who’s reading it. They also ask helpful questions like, “Is there going to be a movie deal?” or “Now that you’ve written this, are you going to try a real (aka “adult”) novel?” I'm also constantly aware that I have an agent, editor, publisher, and readers who are expecting me to write another book. Fast. And all the time, I'm trying to manage my expectations, because I know how lucky I have been so far, and it mystifies me. But I keep looking over my shoulder for luck to run out. 6. There’s no “easy button” for writing a book . . . There are a few things I've learned about writing in the course of getting the first book through the publication process. I’ve learned to focus more structure and on painting specific images and emotions in a reader’s mind than on the sound of pretty words strung together. I know that editors and copyeditors are my safety net and that everyone . . . everyone! . . . at a publishing company works long, hard hours trying to get a book into the hands of the specific readers most likely to enjoy it. But I still know nothing about how to write a book in less than eight drafts. I am struggling with the third book as much as I did with the first two, and all I can do is put my head down, keep writing, and hope that readers will love my weird, quirky characters as much as I do. 7. You’re a writer because you write . . . On this side of publication, I realize I'm no different than I was before my book was published. I write to connect with readers--to share my thoughts with other people--which is the same search for connection that is at the heart of human existence. But whether that connection happens with one person, a hundred people, or a hundred thousand people doesn’t make me any less or more of a writer. I'm a writer for having written, not for having published. As are all writers. Are you writing? Wherever you are on your journey, I hope you're enjoying the path, because that's what counts. Take the time to enjoy every step of the way, and don't focus so much on the end of the path. If you're a reader? Thank you. Overwhelmingly, from the bottom of my soul, thank you! The more I interact with readers, the more I get the opportunity to think about what a difference being a reader makes to the type of human being a person becomes. What about you? Are you writing? Thinking about writing? What makes you want to be a writer? Beautiful Creatures meets The Body Finder in this spellbinding new trilogy. I find these seven things very interesting. I'm an avid reader and a writer so this is really new to me. Thanks for the giveaway! Thanks for stopping by, Natalie! I always love reading about this type of insight from other writers--it's still helpful to me when I have a down day and I feel like I'm failing/flailing at everything : ) So I hope this will help someone else! Good luck with your writing! XO, Christina! Truly, that is what it comes down to. We all put labels on ourselves and set ourselves these enormous expectations that we can't possibly meet because we aren't in control of so much of this process. All we can do is keep writing and concentrate on having the writing get stronger and having the reader see more and feel more of what we are trying to show them. I loved this list. But Yikes--it still takes 8 drafts? You really mean there is no "easy" button?? JK. Good to know that this is a job to take seriously! Oh, Martina, I love this post. Your success is so well deserved, and I love how we're all on this craze journey together. Your book was so lovely, and I look forward to reading all your work in the future. Thanks for all you do for the writing community. Awww. I was so hoping there was an easy button somewhere. Thanks for sharing this with those of us still early in the journey and thanks for a chance to win your book. A beautiful post. Thank you for this! Martina, you captured the experience beautifully. I am really looking forward to meeting you in person one of these days. You wear your heart on your sleeve, you're kind and generous, your words resonate on a deep level, and you're sincerity and goodness and grace shine through. YOU are a gift. It shines through in your writing and in COMPULSION. Thanks for not only this article, but what you do every day. You're so lovely, Liza! To be honest, it's really, really hard for me to open up about some of these things online, but I know how hungry I was -- and am -- for information about this process. And I always feel like I'm oversharing. LOL ; ) Hope we'll be in the same place soon! Also, I LOVED Compulsion! Being born and raised in Virginia, raised around hollow legends and being part Cherokee, SO MUCH of it struck cords with me :) Also, I worked for 13 years for a woman who spent many years living on Wadmalaw Island, and Watson Island reminded me so much of the stories she used to tell us about life 'on the island' Thoroughly enjoyed your book, and gorged on it in one night! And thank you for your kind note about Compulsion. It was so important to me to highlight the nexus of Native American and African American cultures that occurred in the area, and in many other areas--and there will be more commonalities as we go through the series--but no matter how much I research, I'm still always nervous about being respectful and authentic enough, especially where I have to depart from truth to weave the fiction. : ) Your comment is a gift! Yay for SWAG!! I'm dying to read! The odds are definitely not good in this business, and I know that our friends and families don't want us to be hurt by constant rejection. That's why we just have to believe. But it takes more than believing. It takes writing, and reading, and writing--failing and trying again and again. And then it happens, and there's no better feeling in the world than hearing that your characters and ideas have resonated with someone else. So BELIEVE. Keep working. Your family will be so happy for you! : ) Hugs! My family knows that I am a writer and it's not my hobby--they support me in every way. I am very blessed. They know to stay out of my way when I'm on a tight deadline as the stress level bubbles to the surface. 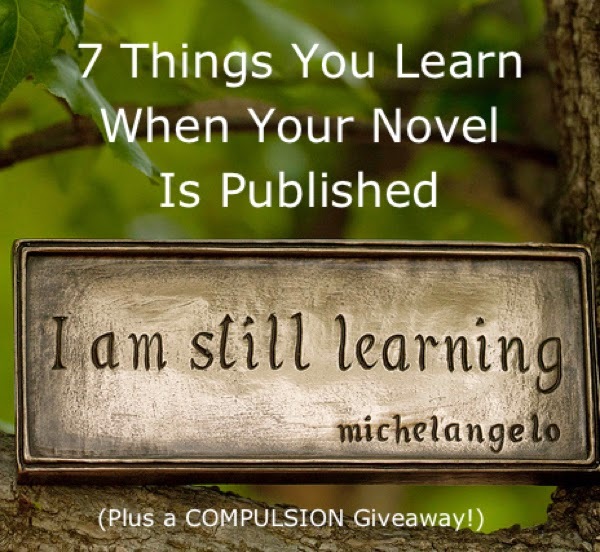 Thanks for the post and giveaway--I can't wait to read Compulsion. You're very lucky, truly! And that deadline thing is key. I love my family tons, and as supportive as they are, they don't get the deadline thing. : ) Good luck! Posts like these help me stay realistic about what being an author will really involve. I find it funny and sad that ones would ask you, "When are you going to write a real book?" Being in the middle of revising my first novel, I'm always looking now at how many drafts a novel takes a published author. None of my writing guides ever warned me just how many it could take and so it's always reassuring to find it takes several drafts. Thanks for the informative post! I know there are authors who nail it in one or two drafts. I just don't have that kind of talent or confidence, so I have to power through it by tweaking here and there. Maybe it will happen eventually. But I also tend to write many different layers and subplots into my books, and getting all those to work together is what really has me pulling my hair. The bottom line is that everyone's process is their own, though. Be comfortable with whatever YOUR process is, even if it isn't as easy as you'd like it to be. You'll drive yourself nuts otherwise! Hugs! Oh, good luck with the queries! And good on you for writing right away instead of constantly checking the inbox. That's the mark of a pro! XO! Really excited to read Compulsion!!! Thank you, Hannah. I hope you'll get to read it soon, and hope that you'll enjoy it when you do. Great post - really must read this book soon! I love your down-to-earth manner and the whole openness about what it was like before and after publishing. You are a true inspiration!! SO many hugs, Carol! I can't wait to have your book out in the world! I've been seeing this book cover everywhere, it seems! I really want to read it! How you will and that you enjoy it, Dede! I enjoyed your post. Although I have not written much of anything yet, I am reading everything I can to learn for when I do sit down and start to write. A lot of writing goes on in your head, so don't feel intimated. I just posted a story idea worksheet today too. Maybe that will give you a jump start? Good luck!